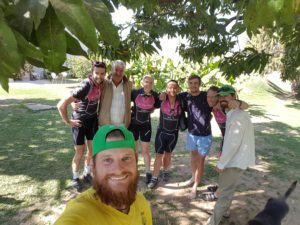 After a really tough ride on day 2 from Buffelspoort to Bakgatla Resort we were all praying for a wind-free day out on the bike. 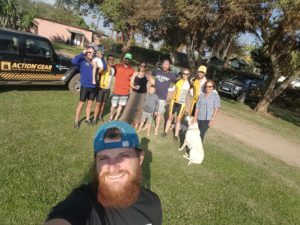 We left Bakgatla a little later than we would have liked to as some of the crew decided to go out for a quick morning game drive in Pilansberg Game Reserve with Alasdair (Cam’s brother who joined us for a night of camping) before getting packed up and ready to ride. 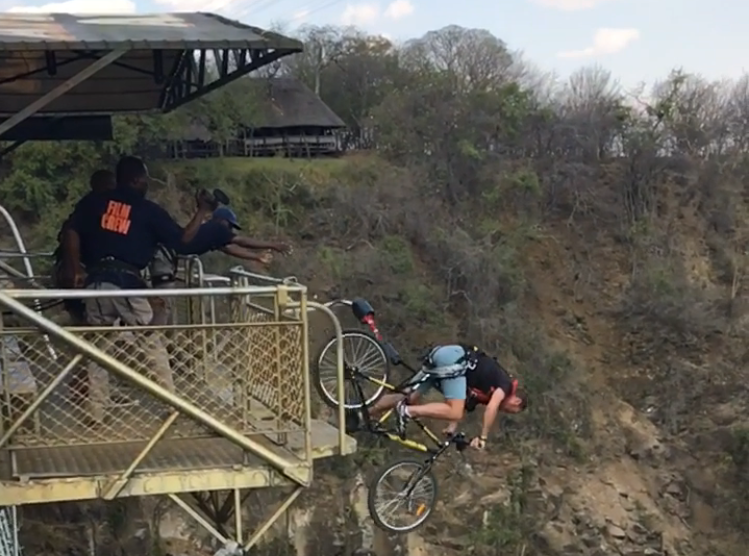 Day 3 ride was 96km from Bakgatla Resort to Marakele National Park which is just past Thabazimbi. 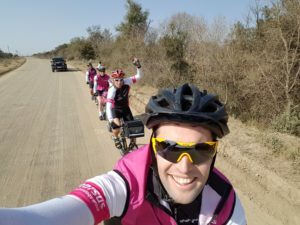 The ride went well for us as we had a tailwind for most of the way and the route was relatively flat or downhill. 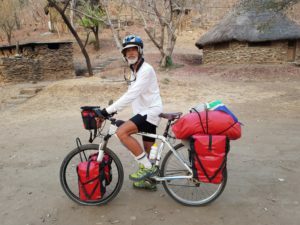 We have also noticed that it is definitely getting hotter as we go north making it essential for us to stop frequently to fill up our water bottles along the way. 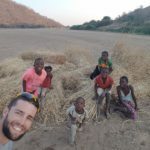 We arrived at Marakele mid-afternoon and settled into camp for the night. The campsite had quite a few ostriches hanging around hoping to find a quick snack but luckily they weren’t aggressive when we shooed them away. 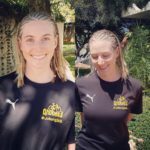 Yesterday we had a 98km ride ahead of us so we got up earlier than the past few mornings to get out on the road around 8am. 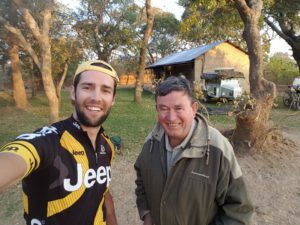 We had not realised that the road we needed to take to get to the main road to Laphalale was in fact a dirt road of 30km. 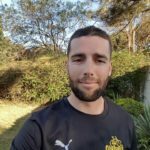 At first it was very rutted and we all feared we were in for a tough day ahead but luckily the road improved and became smoother the further we got to the main road. 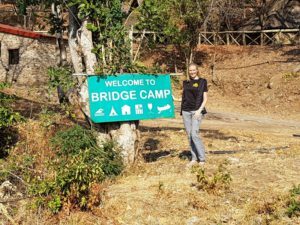 The scenery around us was really spectacular with amazing cliff faces and bushveld which made it all worthwhile. 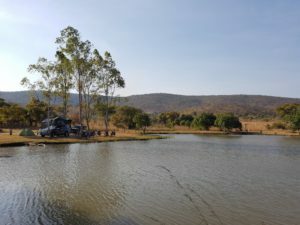 Marakele is definitely a place we will be visiting again in the future to explore it more next time. 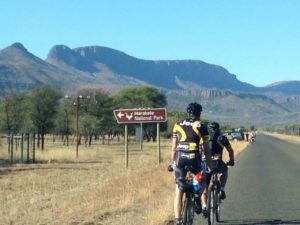 Once we hit the main road it was just long rolling hills ahead of us with bushveld on either side of the road. 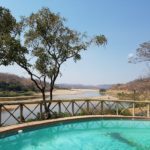 We must have seen at least twenty warthogs along the road as well as sable and kudu which was great. 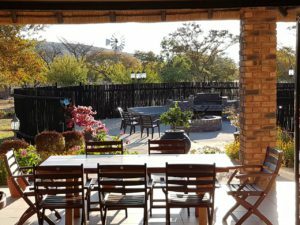 Bryan had driven ahead to Laphalale in the Ford to get supplies and to sort out a campsite but it so happened that the campsite we planned to stay at was fully booked. 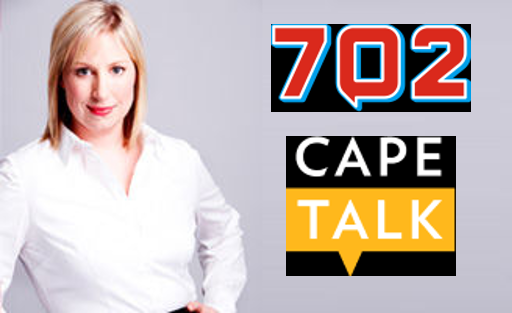 He then called a few other places who also were booked up probably due to the public holiday tomorrow for Voters day but eventually he got hold of a place called Marulasfontein Game Ranch. 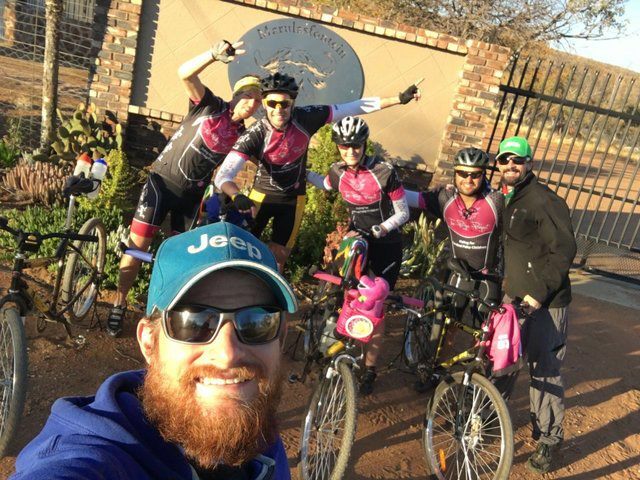 By the time Bryan had informed us of the change of plan in where we were staying we had in fact ridden 10km past the place.We were all very bleak that we had to turn around to cycle back but it was all worthwhile as the kind people at Marulasfontein Game Ranch let us stay in their beautiful luxury lodge so we didn’t have to setup camp for the night – What a treat to sleep in a bed for a night (it’s the small things that you take for granted). 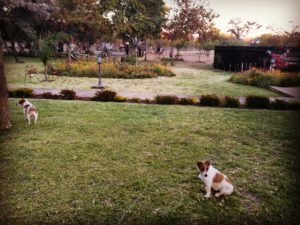 Marulasfontein also has two sweet Jack Russells’ who enjoyed spending time with us around the boma fireplace which Cam especially loved. 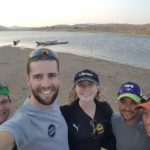 We all had a really good night’s rest but had to be up at dawn this morning to be able to get on the road as early as possible as we had a long day ahead of us to get to the Botswana border post Martin’s Drift (Grobler’s Bridge on the SA side). 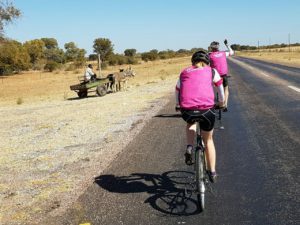 As Marulasfontein was 20km further than where we originally planned to stay, it turned out that we had to ride 130km today so we needed to really push hard. 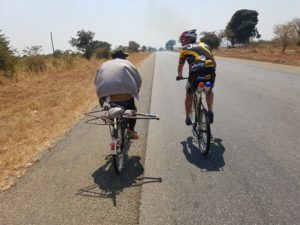 For the first 50km we had a bit of a headwind so we were riding in single file most of the way. We have also noticed it is definitely getting hotter as we go north and so our STUF sunblock has been a lifesaver to protect us. 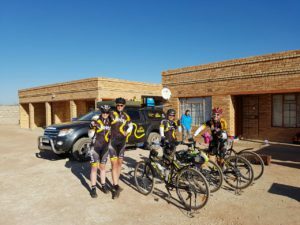 We all had to really dig deep today to get to the border post but we made it in just over 6.5hrs. 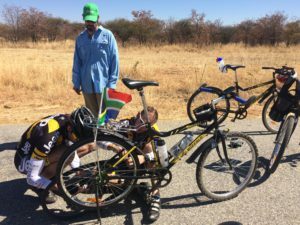 It was such a special moment for us all to have finally reached our first neighbouring country Botswana on this Joburg2Kili adventure. 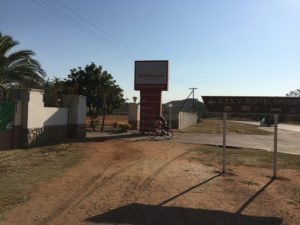 Tonight we are staying at Kwa nokeng, which is a campsite on the Limpopo river right by the border post. 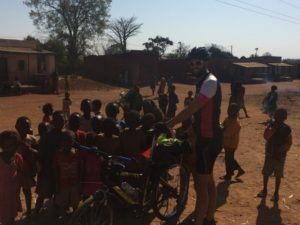 We have a rest day tomorrow which is much needed after over 500km of riding in the past 5 days. Our send off yesterday was absolutely amazing and we are so grateful for everyone that came to support us. 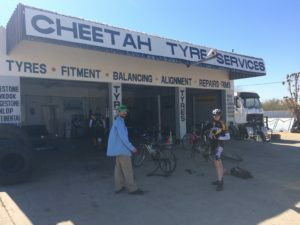 Jeep kindly let us start our journey from their Fourways dealership where we were greeted by friends, family, sponsors and fellow cyclists who rode a portion of our first day with us. 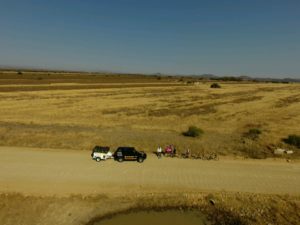 We were led out by ER24 and had a convoy of Jeeps follow us out the dealership which created an awesome atmosphere. 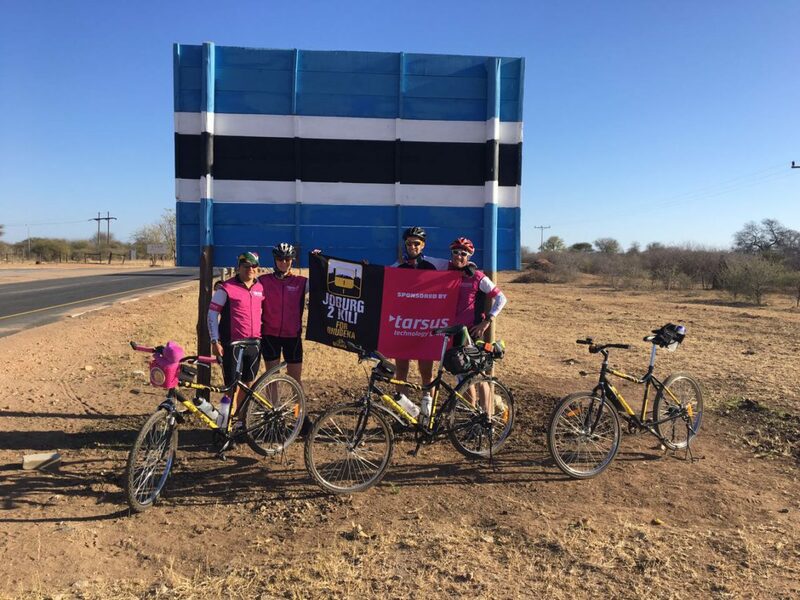 We then rode out past Lanseria Airport to Stornoway Lodge where they had setup a water/coffee stop for more of our supporters that came to wave us goodbye. 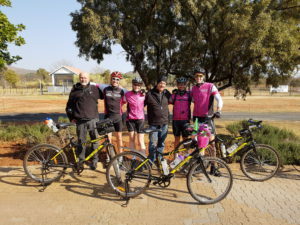 After a short stop most of the cyclists that joined us left and then reality set in as there were just five cyclists left – the four Joburg2Kili cyclists plus a supporter, Deon Bester, who rode with us the whole way to ATKV Buffelspoort along with his wife, Sonja who followed in her car – thanks so much Deon & Sonja for the support! 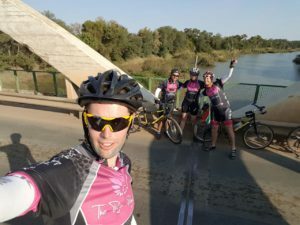 The rest of the ride was quite tough as we had a fair amount of climbing until just past Harties where it flattened out. 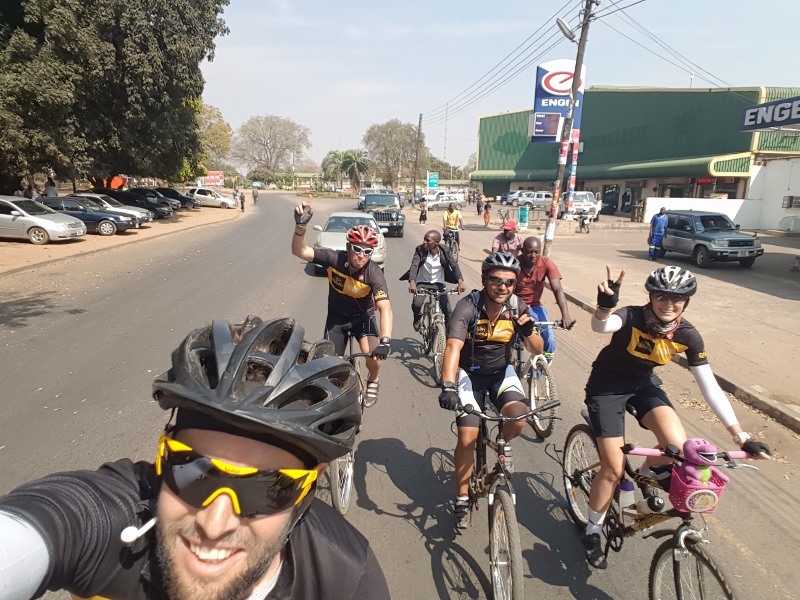 We had a quick stop off at the Steers on the N14 to get our energy levels back up and then rolled into camp mid-afternoon. 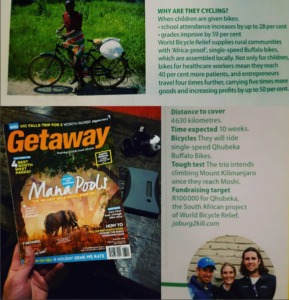 Our total distance for our first day was 100.8km which took us 5hrs27 in ride time. 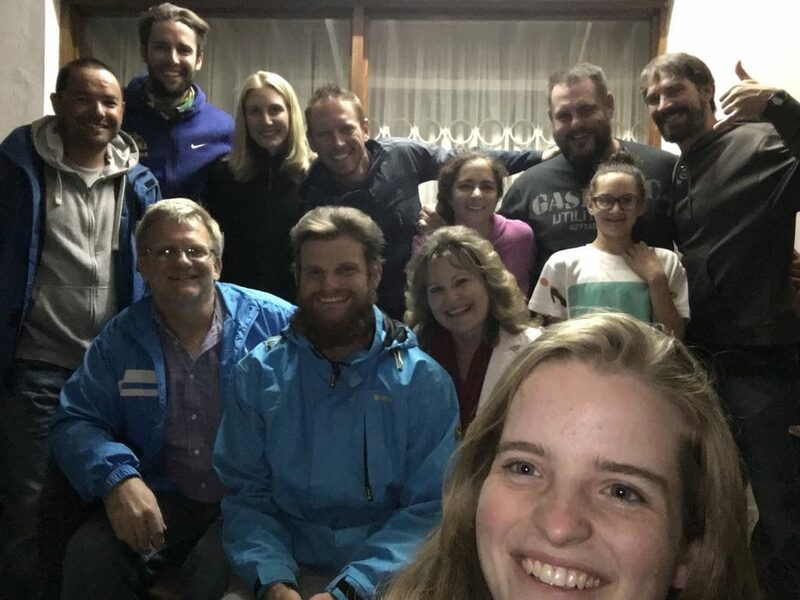 We were all pretty exhausted from an awesome first day of our Joburg2KIli journey. 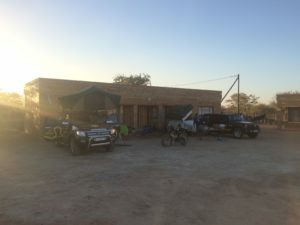 This morning was quite a slow start to pack up but I think we will be pro’s at packing up camp in a few days time. 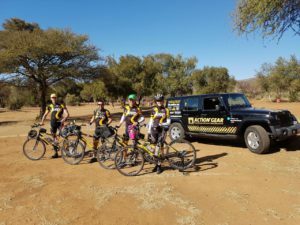 We were very grateful to have Anthony and Giovanni from Qhubeka come through to see us off this morning which really gave us much needed motivation for a tough day on the bike. 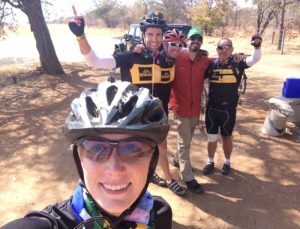 The first half of the ride included 18km along a rutted dirt rode which was brutal on our bodies. 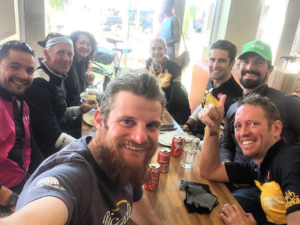 We then hit the tar rode to Sun City and thought things could only get better but unfortunately the wind picked up making the last 50km of our ride really hard but thank goodness we had Racefood Farbars to keep our energy up. 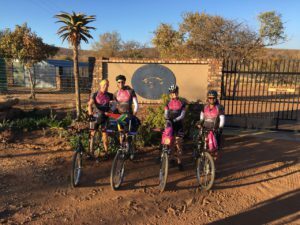 We were all very happy to roll into Bakgatla Resort in Pilansberg this afternoon which is where we are spending the night. 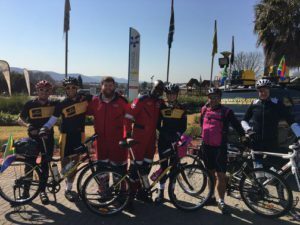 Our total distance today was 86.58km which took us 5hrs34 in ride time so longer than yesterday due to the wind. 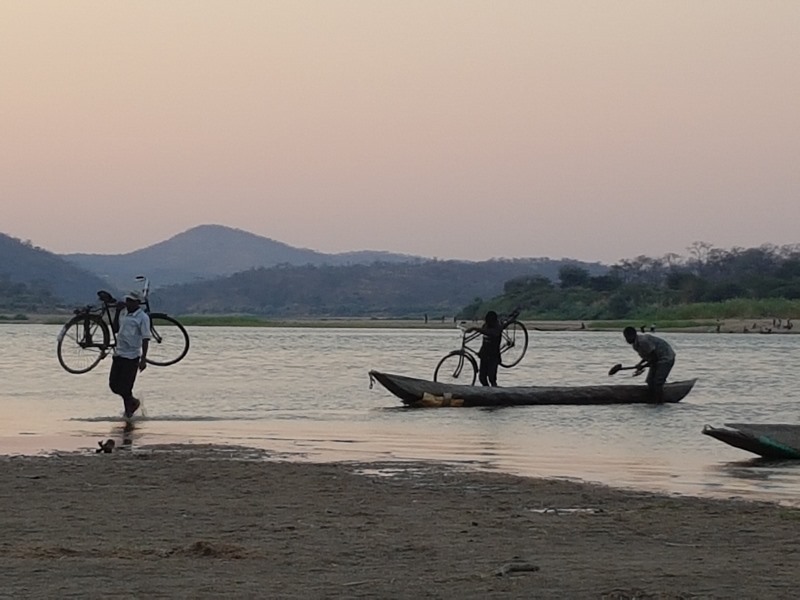 Tomorrow we off to Marakele which is a 93km ride – please help pray for no headwinds! 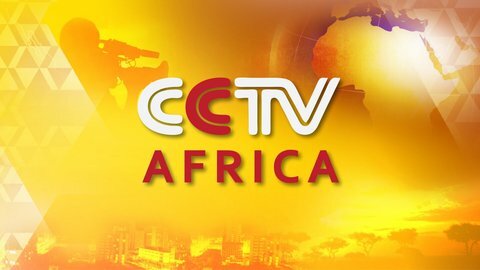 Thank you to CCTV Africa for the interview on our upcoming #Joburg2Kili Expedition to raise funds for Qhubeka. 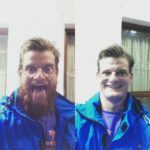 Joburg2Kili expedition cyclist, Gareth Pickering was recently interviewed by Simon Hill (@saltysnollie) on the Hot 91.9FM “The Sports Cage” show.